I received my kit today and it appears that the MV-161A is slightly different in that it does not reuse the stock plate. I didn't have to grind/file the ears at all. It dropped in and fit tightly. I got it installed and still couldn't start up my truck. DOH! Hopefully a buddy of mine will swing by tomorrow so that I can diagnose if it is a spark or fuel issue. That one is different from the MV 161 I bought. Are you shure it is a 24V one? There is a 12V Version also. 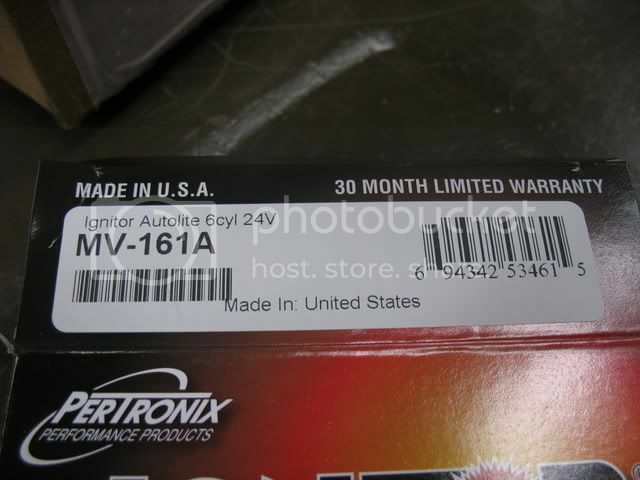 I finally installed the Pertronix Electronic Ignition. I have never done anything like this and at first it seemed intimidating. 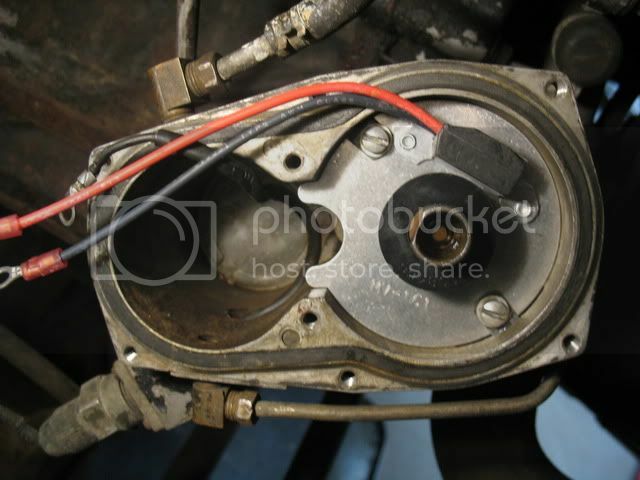 What really helped was to read the directions a few times, then go out and remove the distributor cap, read the instructions again finding the parts and it then all the sudden became very easy. Like the coil in my brain finally got power. Amazing! Also, put the screws and tabs on the plate before installing it in place in the case. Then, rotate the tabs where they belong and tighten. Mine actually took a smaller screw than was originally used. It took me about 2 hours but I did a lot of looking and reading first. It cranked right up the first try! Thank you for the above help!! Congrats on the install Kyken. I pulled the hose off the inlet of the fuel filter on my truck last night to see if I was getting fuel and my truck fired right up to my surprise. I quickly shut it down, drained the fuel filter (some sediment), and tried starting up again...with no success. I think I either A) have a fuel filter with too much restriction or B) the fuel pump is going south. 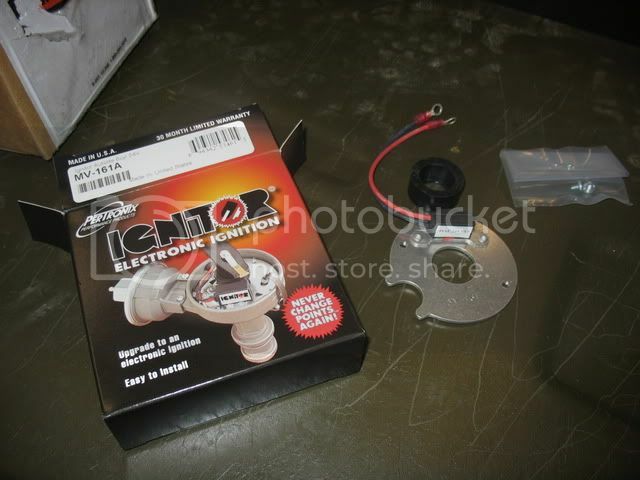 I am going to try a new fuel filter tonight and if that doesn't work start working backwards. Sound logic Cornholio...carry on and hope it is fixed soon. CH, I just noticed your picture above included the two plate screws. Mine were missing. Oh well, not a problem. I found some in my "leftover screw box". Another tip: Don't forget to check the oil wick just under the rotor since it's off. Cornholio, question for you. Did you remove the lubricating pad at the top of the distributor shaft, under the rotor or is it missing? It's a coincidence that I removed my ignitor cover today and oiled up my pad. A very important preventative maintanence issue. I've heard people say it's a felt pad, but mine is a piece of foam it appears. Anyway it took a few good drops of oil before it became saturated. I feel better now that it's done. militarypotts Spec/4 Military Police, Vietnam Era, "Does the noise in my head bother you? Welcome to the Twilight Zone!" Kyken, yes, my kit came with screws but I just ended up reusing the original ones because they fit. Do you want me to mail you the ones that came in my kit? Good eye Militarypotts. I read about the lubrication issue while researching this upgrade and in the process put a few squirts of 10W30 down the shaft underneath the rotor. There was NO felt or wick under the rotor so I didn't know it was missing until you just mentioned it. I will check the shaft on my spare engine and swap out the missing piece if it is there. Thanks! Cornholio, THANK YOU for the offer! I found 2 screws that fit perfectly that were new in my box of spares. I just looked at my extra distributor to see if it has a wick and it does not. Sorry, I was going to send it to you. Good luck with the fuel issue!